Although the Philippines has only a few Internet service providers, choosing the right one still proves challenging. 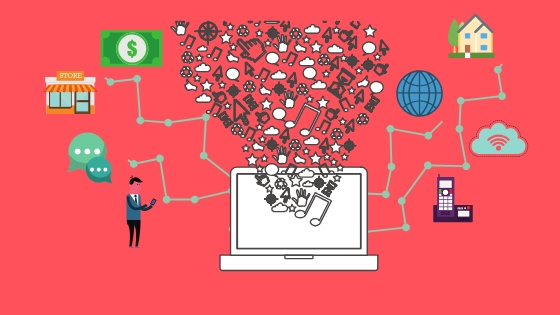 You have to look into the pricing, data offered, download and upload speed, and the connectivity in your area. To help you decide, we put together the three most widely used internet service providers in the Philippines. Philippine Long Distance Telephone Inc. (PLTD) is one of the most established telecommunication companies in the country. It has wide service locations; covering nearly all areas in the Philippines. It is also the most popular internet service provider for both home users and business owners, offering different plan options to match every lifestyle, need and budget. For remote employees looking to have a fast and reliable internet connection that won’t break the bank, PLDT Home Fibr offers a variety of packages for as low as Php1,299/month to Php2,899/month, with speeds of up to 3Mbps to 100Mbps. Likewise, PLDT Home DSL offers packages ranging from Php1,299/month to Php2,899/month but with speeds of only up to 20Mbps. You can, however, avail its free speed boost of up to 100Mbps for 3 months. If you want to enjoy smooth video streaming and video conferencing, PLDT home plans won’t disappoint. PLDT also offers a few plans ideal for small business owners and startup companies. MyDSLBiz provides a premium DSL connection starting at 10Mbps to 20Mbps. This package comes with a free landline and provides 1 Static IP (/32 IP Block). FibrBiz offers a speed of 20Mbps to 200Mbps. It is bundled with free landline and a pocket WiFi so you can stay in touch with your business inside and outside your office. The second leading internet service provider in the Philippines is Globe Broadband. On top of its good internet connection, Globe also offers a huge variety of home and business internet solutions and packages for both business and personal use. 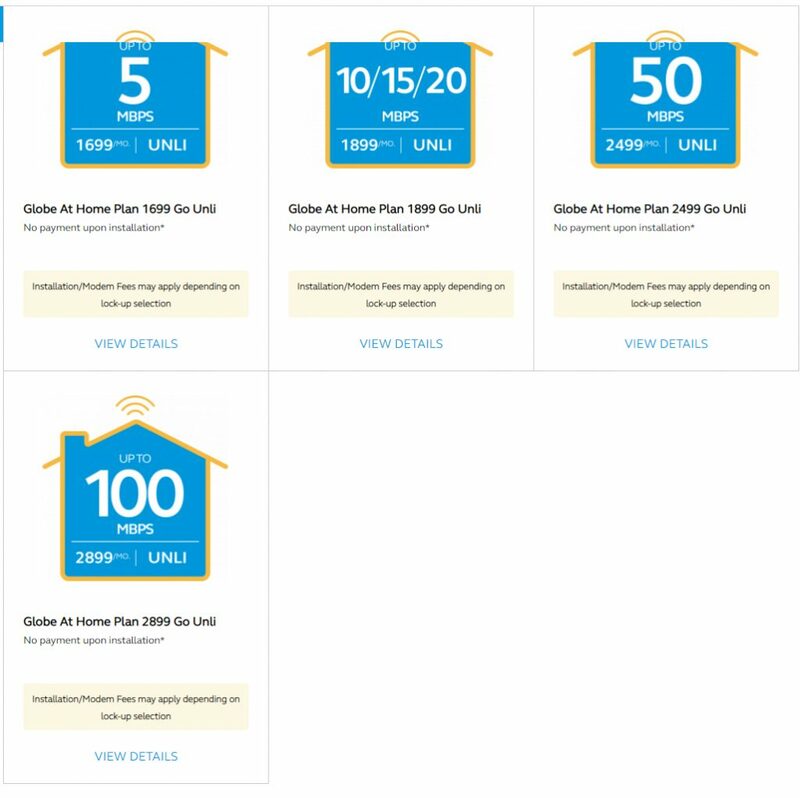 For high-speed internet, the Globe at Home Plan offers eight options. The cheapest plan starts at Php1,299/month with speeds of up to 5Mbps and 300Gb worth of internet data. The most expensive plan is at Php9,499/month with speeds of up to 1Gbps and 6Tb worth of internet data. 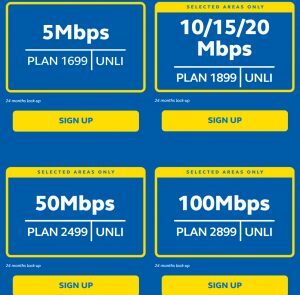 For unlimited internet, the Go Unli Plans (another category under Globe at Home Plan) offers four options, with the cheapest one beginning at Php1,699 with speeds of up to 5Mbps. The most expensive package is at Php2,899 with speeds of up to 100Mbps. When it comes to SMEs, Globe Mybusiness offers an array of options that will certainly boost your productivity. For as low as Php1,699/month you can get 5Mbps of unlimited internet data. Most plans come with freebies such as landline with free calls and a modem. You can also get add-ons like WiFi hub, multi-channel CCTV, and mobile pocket WiFi. 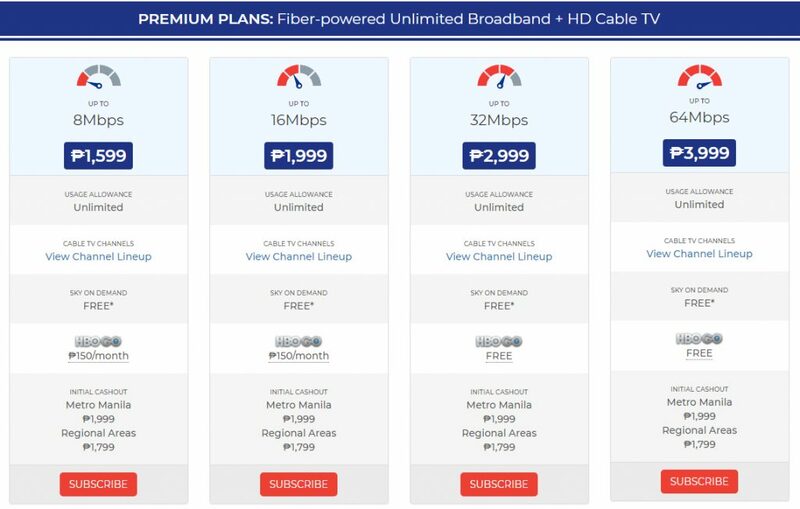 The downside is that while Globe Mybusiness plans can offer speeds of up to 100Mbps as well as various freebies and add-ons, they are only available in selected areas. Globe also has Mybusiness Mobile WiFi, perfect for entrepreneurs who are always on the go. It has high-speed internet connectivity with speeds of up to 42 Mbps on LTE and can connect 10 to 40 users. Users can go online using any device – anytime, anywhere. Depending on the plan, the monthly data allocation ranges from 1.5gb to 8gb. 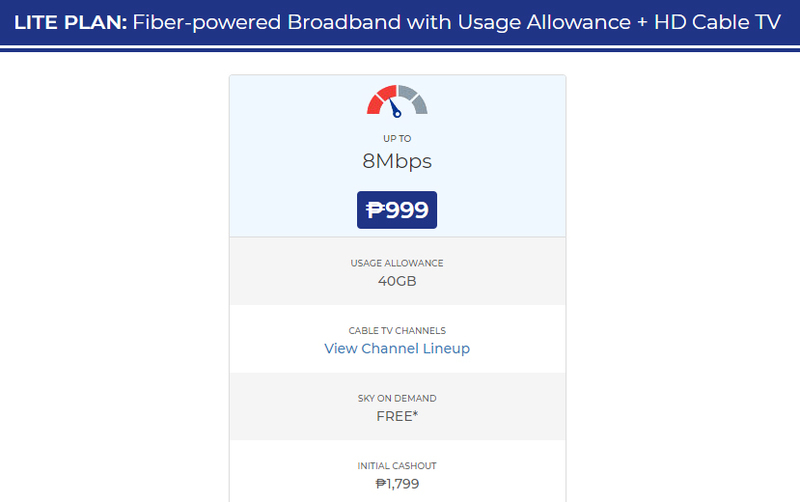 A product of the country’s longest-running Cable TV provider called Sky Cable, Sky Broadband is an ideal option for the budget conscious consumer. Although not as popular as PLDT or as huge as Globe, Sky Broadband also has a range of bundles for every need. And whether you want cable TV or not, you will automatically get it even if you just subscribe to their broadband service. 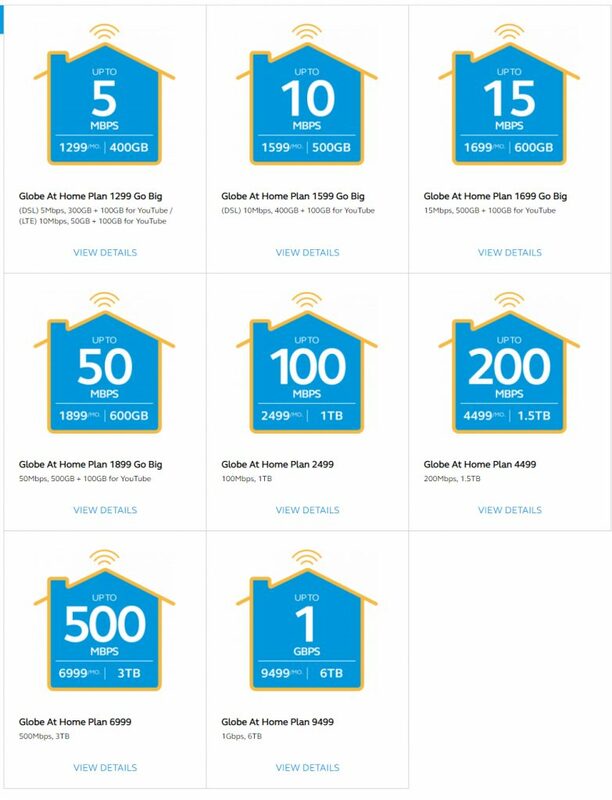 For starters, Sky Broadband has three main plans – One Sky Fiber Premium, One Sky Fiber Lite, and One Sky Fiber Streaming. One Sky Premium plans come with fiber-powered unlimited broadband and HD cable TV. The lowest package costs Php1,599/monthly with speeds of up to 8Mbps while the highest package costs Php3,999/monthly with speeds up to 64Mbps. One Sky Fiber Lite plan offers 40gb usage allowance and HD cable TV, plus free HD box. For a price of Php999/month you can already experience a speed of up to 8Mbps. One Sky Streaming plans come with fiber-powered unlimited broadband and free access to Sky on Demand. Plan options start at Php999/monthly with speeds of up to 5Mbps to Php2,499/month with speeds of up to 50Mbps. Since Sky Broadband is still new in the market, its guaranteed minimum speed is only up to local sites connected to the capital server which is in Metro Manila. Plan availability varies per area as well. In most cases, Sky Broadband subscribers live in major cities. Internet issues are unavoidable. While you want faster internet, this might often mean paying a higher price. So how do you boost your internet connection without necessarily upgrading your plan? We’ve rounded up a few easy tips to get you a faster connection. The first thing to do is to test your internet speed to get an idea of how fast your internet connection is. We suggest doing it using Speed Test by Ookla. Then test it again after you have made some changes to see if there is any difference. Give your modem and router a quick reset every week or month to refresh your internet connection. Although this method won’t automatically speed up your internet, it usually helps. Exceeding your data limit will slow down your internet speed. If you are not sure whether or not you have a data cap, contact your internet service provider. Find out the achievable speed in your area. 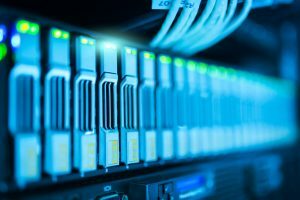 A number of internet service providers are starting to use a fiber connection to offer high-speed internet connection. If you have had your broadband for a while, maybe it’s time to upgrade. 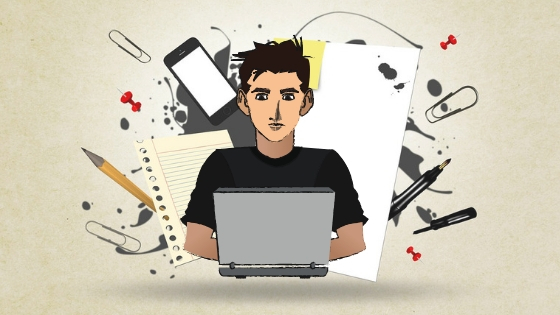 A lot of apps and software could be running on the background without your knowledge. To increase your speed, remove apps you don’t need. You may also want to quit or pause bandwidth-heavy services like software updates, cloud storage (i.e. Dropbox), audio and video streaming (i.e. Spotify), and video and web conferencing (i.e. Skype) when doing more important tasks. Avoid using a telephone extension lead with your router. If it’s not possible, try using the shortest one you can. If you are using your laptop with a wireless connection, use a network cable to connect to the router. Lastly, make sure that your WiFi is password protected. Otherwise, other people can use it without you knowing and therefore causing a slowdown. 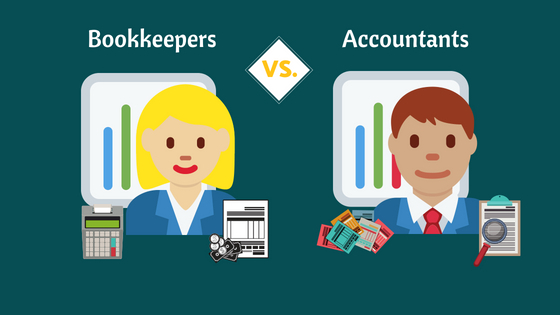 Thinking about hiring a Filipino worker? Whether you need a fresh graduate or an expert with years of experience under his/her belt, we can help you find the right individual. Contact us.